Growing your Garden Plants from Cuttings. An inexpensive way to get new plants is by taking cuttings. It is important to use a good sterile rooting medium to give your plants a good start. Soil or compost are not good choices because they are not sterile. 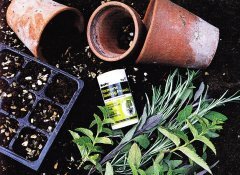 Personally, I much prefer the convenience and guaranteed correct recipe that you get from buying a ready-made seed starting medium. If you prefer and are taking lots of cuttings you can mix your own. You will need sharp scissors or Secateurs, labels, pots and clear plastic bags. 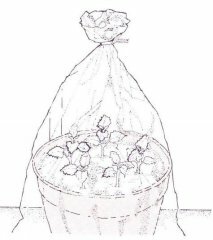 Use the plastic bags to cover the cuttings to prevent water loss from the plants while they are forming roots. Make sure everything is clean. So if you use your old planters be sure to clean them thoroughly. If this is your first attempt at taking cuttings, softwood cuttings are good a good place to start as they are the simplest to propagate. Cut new growth from the plant in late spring or early summer. Many shrubs and trees root well using this method. Since plants are making most of their growth at this time of year it also follows that they will also make good root growth. It is best to take cuttings in the morning and place the stem in water for about an hour or so while you are preparing the planters for planting. Cut the stems at an angle(45-60 degrees) to give the cuttings more cut surface to form their roots. 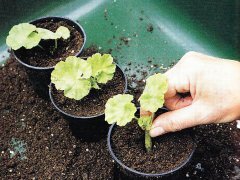 Most cuttings root best if the cut is made a centimetre below the leaf node(where a leaf meets the stem). Strip the leaves off the lower parts of the stems leaving only the top leaves. If the leaves are large on top cut them leaving only half a leaf. 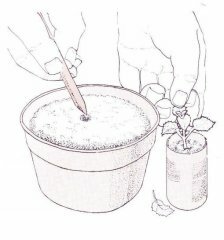 With a stick or pencil make a hole in the planting medium for the stem to fit into. 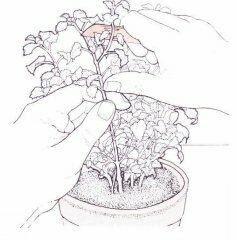 If you use a rooting hormone first dip the stem in the powder then slip the stem into the hole that you have made, then firm the planting medium around them. Once you have your cuttings planted put the planter in a saucer of water. Leave the pot in the water until you can see that the planting medium is moist. Then remove the planter from the saucer, let it drain, then place the planter in a sealed plastic bag and set on a windowsill. Open the bag up for about ten minutes each day to let fresh air circulate. Cuttings vary in how long they take to root. Some plants can set roots almost immediately, while others take weeks. After about a week start checking gently tugging the stem to see if roots are forming. If you feel resistance roots are forming. When roots have formed take the plants from their bag and give them a weak solution of fertilizer. After about two weeks re-plant in individual planters in a soil based potting medium. Remove the cuttings with a sharp knife or razor blade, making sure the cut is just above a node. Fill a planter or tray with compost, pressing it level. Trim off bottom leaves and dip cut ends into rooting powder. With a dipper make holes in the compost. Insert, firm and water the cuttings. Cover with a polythene bag and place on a warm window sill or in a greenhouse. If condensation develops, change the bag for a dry one every day or two. The top of a plastic lemonnade bottle makes an alternative cover. Cut with a sharp knife about 12,5cm down from the cap which can be opened and closed for ventilation. Select your cuttings; this is best done in the morning. The plant stems should be soft and in active growth: these are known as softwood cuttings. Avoid, if at all possible, stems coming into flower, as this tends to inhibit rooting. If this is not possible, make sure that all flowers and buds are removed. Never select wilting stems. Make sure, too, that the material is free from pests and diseases, and is true to the type of plant to be propagated: if the plant has variegated foliage, the stems selected for cuttings should be well variegated.